Preheat Overn to 200oC or Gas Mark 6. Lightly grease muffin tin or line with baking cups. In a mixing bowl, stir together cream flour, rye flour, baking powder, sugar, caraway seed, salt & pepper. Make a well in the centre of the dry mix. In another mixing bowl, whisk together the egg, milk, oil and then add to the dry mix. 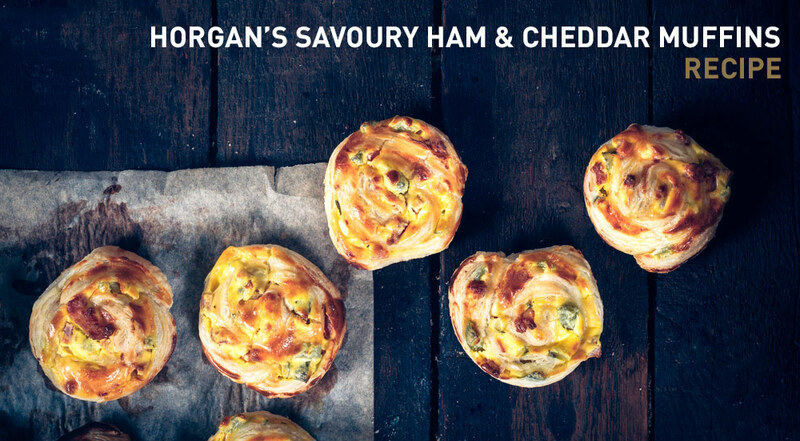 Add the diced Horgan’s Honey Baked Ham and grated Horgan’s Vintage Cheddar cheese. Stir until just moistened through and then sppon the mixture into the muffin tins, approximately 2/3 full. Bake for 20 minutes. Take out of the oven and sprinkle some more grated cheddar on top. Return to the oven for 1 minute, or until the cheese is melted. Remove from pans and cool slightly before serving.